Does your client delay going to bed because they are worried that they will not sleep and lie awake all night? Now and again most of us have periods where we cannot sleep - perhaps putting this down to insomnia. However insomnia is an inability to sleep naturally whereas the Fear of Staying Awake at Night script addresses the issue of not wanting to go to bed early just in case sleep doesn't happen. Staying awake all night is not as bad as most people imagine - so long as you or your client has a strategy to cope with this - it can be quite enjoyable. 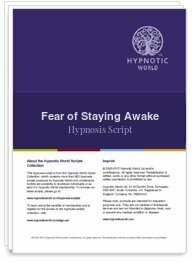 This hypnosis script can enable your clients to go to bed early - regardless of whether or not they will sleep - and reap the benefits that are associated with sleep and rest.